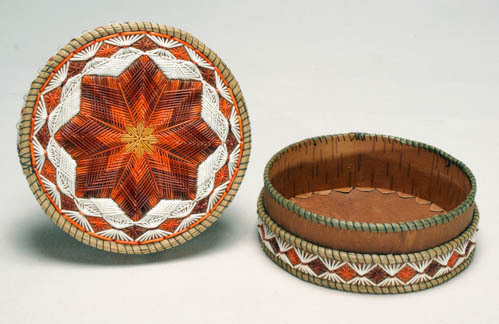 Round birch bark lidded box with dense red-brown, orange, yellow, and white quillwork on lid and sides. 1. 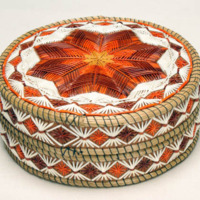 Form: The lid quillwork features an 8-pointed star in many layers of color. In the center is a star of yellow spanning 1 inch. This is outlined by a layer of orange, then red-brown, then alternating orange and red-brown. The entire star spans nearly 4.5 inches. A ring of white circles around the star, and the spaces between the points are filled with crosshatched white. A band goes around the outside of the lid, with a ring of orange bordering the outside. Around the inside of the band is a repeated design of 9 white quills lined up vertically and bunched together in the middle by a red-brown band. In the diamond-shaped spaces between these are 10-point asterisks which alternate in color between orange and red-brown. along the sides are 2 bands (top and bottom) of the same pattern. 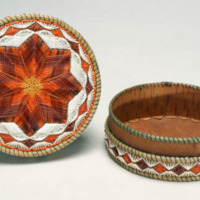 Sweet grass is wrapped around the top and bottom of the lid, top and bottom of the base, and middle of the base - bound by black stitching which holds the box together. 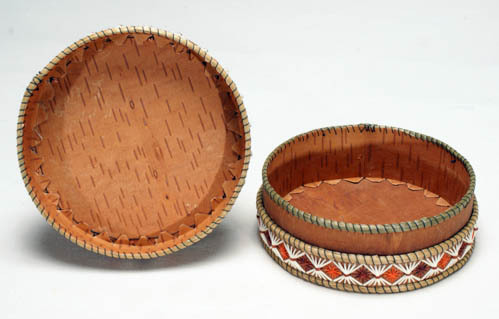 The inside is lined with bark to hide the quill ends. 3. Construction: Bark was cut, bent, and stitched into shape. 4. 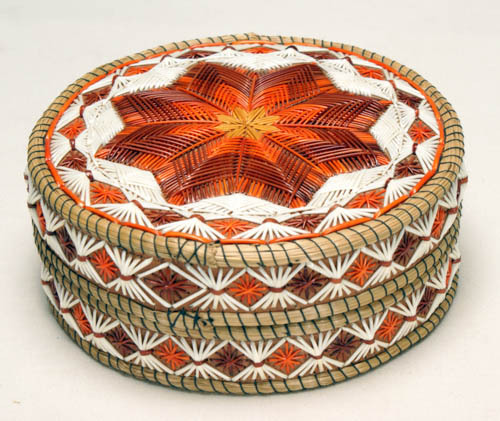 Decoration: Quillwork decorates the top and sides, sweet grass is wrapped around the edges. 6. Condition: Very good: negligible wear, label on bottom. 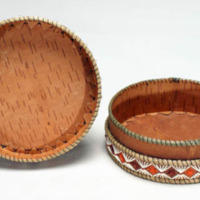 “Birch Bark Box,” Mathers Museum of World Cultures Digital Exhibits, accessed April 23, 2019, http://dlib.indiana.edu/omeka/mathers/items/show/233.